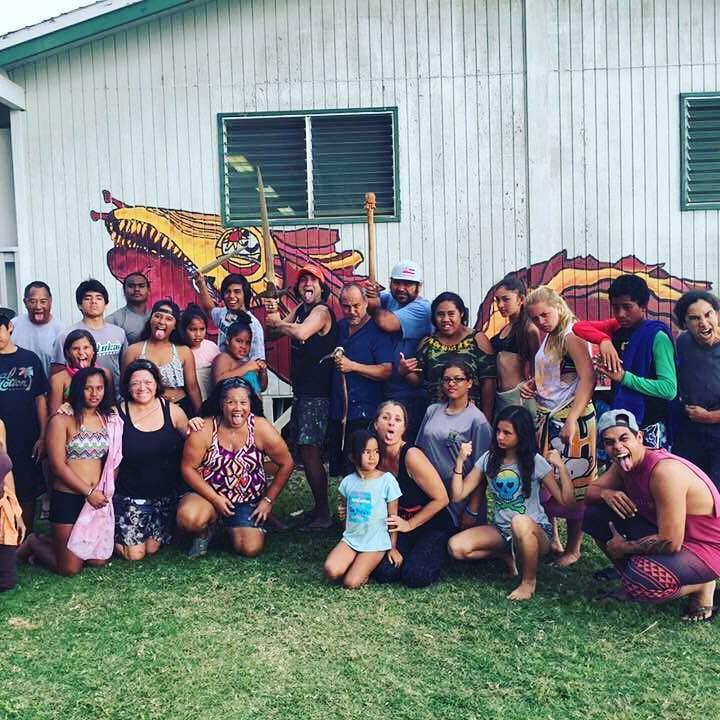 The "Moloka'i Nui a Hina" mural team bonded through weeks of storytelling and cooking, eating, and camping with five artists from O'ahu. Together, they distilled ideas and images to create eight mobile murals which are on display at the ARTS at Marks' Garage through July 31, 2016. Five O'ahu artists, three Moloka'i artists and sixteen teens, plus their support crew, worked on the murals. Here, the early phase of sketching in elements of each panel. A new show at the ARTS at Marks’ Garage showcases the joy and community spirit of the Friendly Isle. 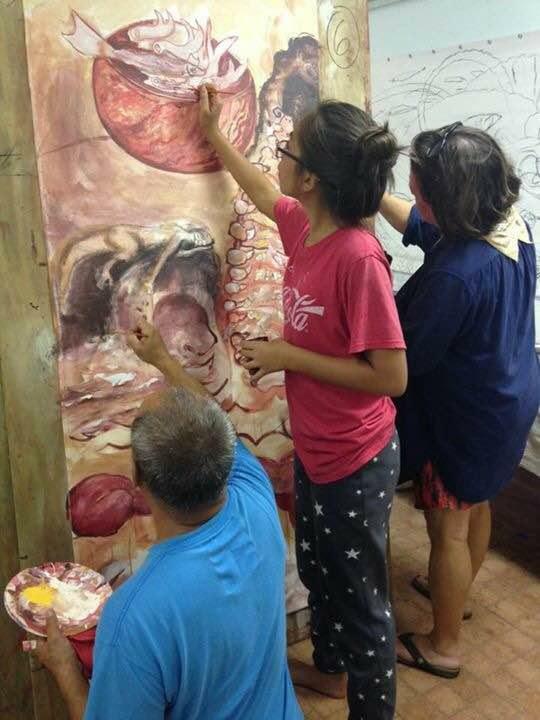 Recently, five professional off-island artists banded together with three artists and sixteen teens from Moloka‘i for a visual exploration of legends and values cherished there. 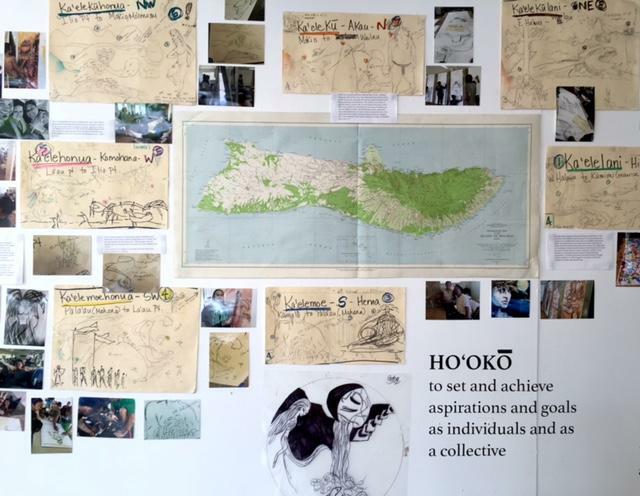 HPR’s Noe Tanigawa reports what happened was an unforgettable deepening of commitment to the island. The "Moloka'i Nui a Hina" project brought O'ahu artists, Moloka'i artists, teens, and respected elders together on a project that deepened aloha 'aina. “Moloka‘i Nui a Hina,” continues at the ARTS at Marks’ Garage through July 31st. The mobile murals will have a semi-permanent home at Moloka‘i High School library. When Maui girl Tanya Maile Naehu married and moved to Moloka‘i, she was surprised at the lack of art and theater opportunities there. An educator by trade, with a degree in Hawaiian studies, one day Naehu met arts enabler, Meleanna Meyer, who asked what she really wanted to do. After images were sketched in, artists and teens added the color. muralists if Naehu could raise the funds. Naehu wrote grants, recruited kids from all Moloka’i’s schools, and started weekend camps in mo‘olelo and storytelling. The Consuelo Foundation gave seed monies for all the supplies for the mural and sponsored their travel to Honolulu for the exhibit. Naehu says the Atherton Foundation gave a big chunk and the rest was raised through private donors via indiegogo or individual donations. Digging deeper revealed even more embedded in the mo‘olelo, Naehu says, like explanations for the behavior of winds and rain, and why for example, mullet aren’t migrating as they used to. Students got to see that reserach is often a huge part of art making. Here, a map of Moloka'i, some of the spots depicted in the murals, and auxiliary notes. Last February, artists Solomon Enos, Al Lagunero, Kahi Ching, Harinani Orme, and Meleanna Meyer spent a week camping and brainstorming with artists Maile Naehu, Koa Kakaio and Kālā’e Ritte-Tangonan and sixteen teens. 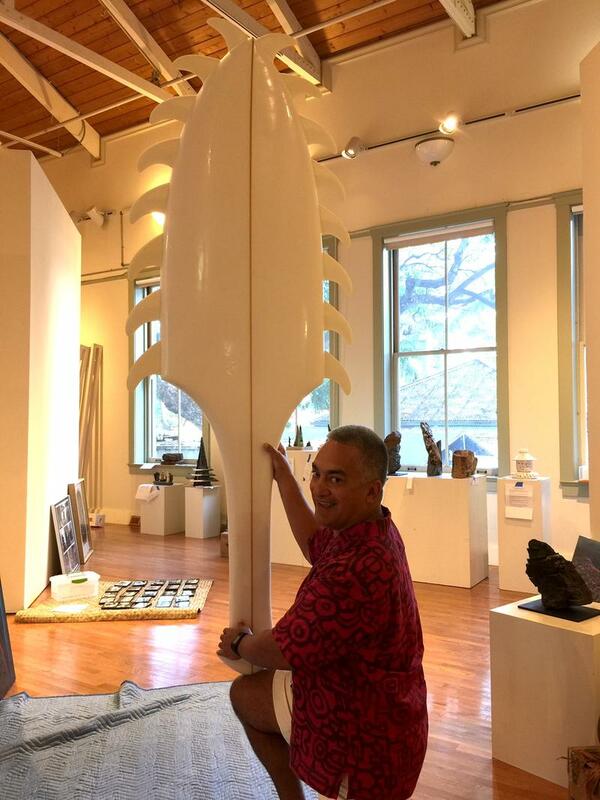 Then, mo‘olelo images mixed with a deeper understanding of place, when the artist teams hunkered down for another week in April, camping, cooking, painting together at Keawanui Fishpond. 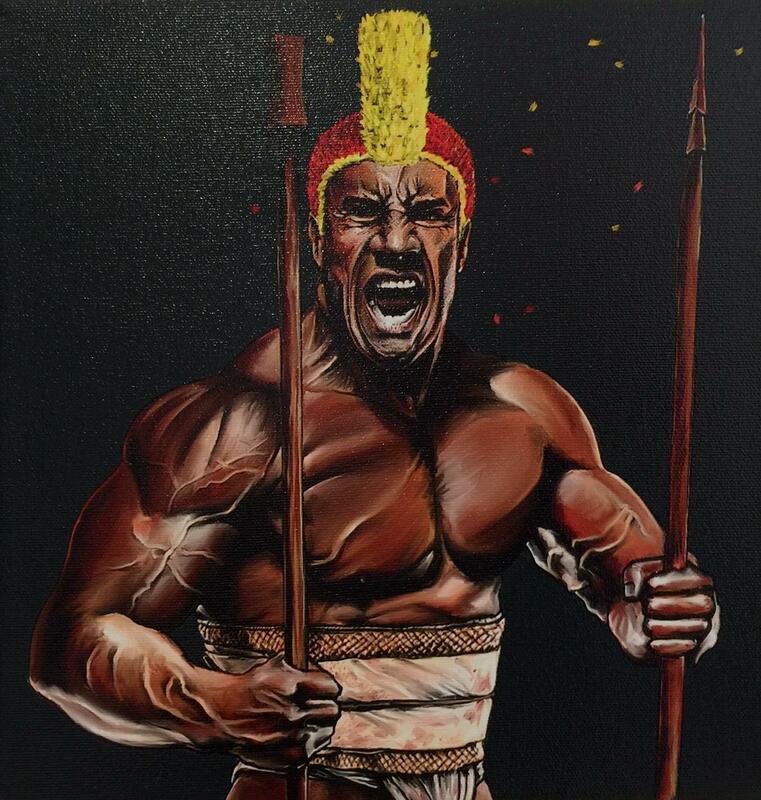 I asked ‘Ilima Kaawa Ricardson how the master artists got everyone drawing and painting. Each mural relates to a place, with images of different mo‘olelo. Last Saturday the whole contingent brought Moloka‘i to Marks’ Garage. They’ve ended up doing poetry, spoken word, plus the murals and other visuals. The exhibit, "Moloka'i Nui a Hina, ART MO'OLELO", runs through July 31, 2016 at the ARTS at Marks' Garage. 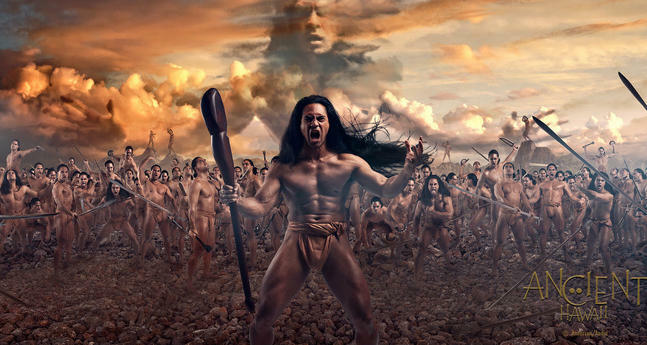 Focus on the mo‘olelo of Moloka‘i added depth and context to the “Moloka‘i Nui a Hina” project. Naehu relied on Molokai elder, Aunty ‘Opu’ulani Albino, to convey the stories that ultimately served to link teens more closely with their island. Albino studied with renown Moloka‘i kumu hula, John Kaimikaua. This show is also an introduction to three Moloka'i artists, including Tanya Maile Naehu, who designs fashions as well as art projects. You may enjoy her Instagram site. See works by Koa Kakaio and Kālā’e Ritte-Tangonan below. Batiks by Molola'i artist Kālā’e Ritte-Tangonan line the windows at Marks' Garage. Maile naehu says sometimes Moloka'i residents wake up to wall murals Ritte-Tangonan has painted overnight! Examples of work by Moloka'i artist Koa Kakaio are also on display in the gallery. 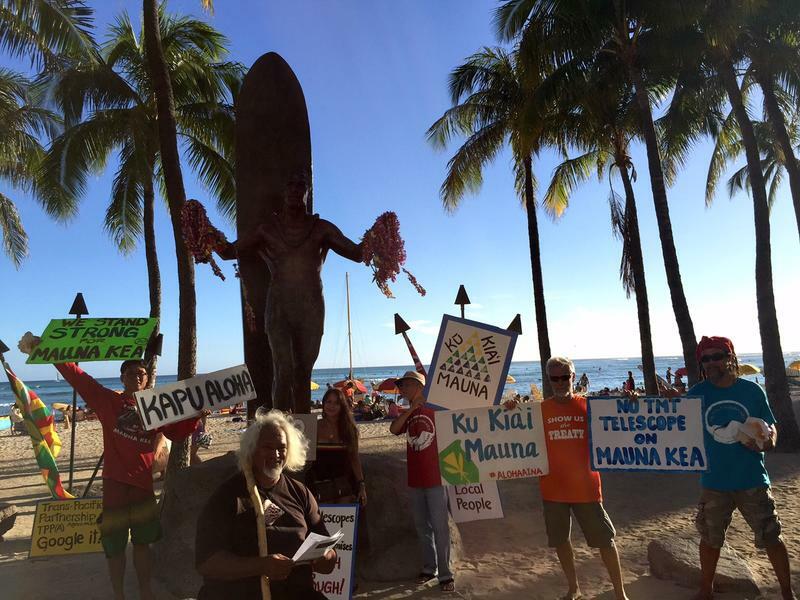 Over the next few days we’ll hear different voices speaking to the meaning of aloha ‘āina. We begin at the Kamakakūokalani Center for Hawaiian Studies on the UH Mānoa campus, sitting in the office of Professor Jon Osorio as the birds outside his window call to each other. “Aloha ‘āina is a relationship not just with the land but really with nature itself and in particular that part of the land and sea and streams and water that actually sustains life. On the thin stretch of land between stark, sere cliffs and bright blue ocean Auntie Puanani Burgess sits in Wai‘anae’s Hale Na‘au Pono, talking about aloha ‘āina as the traffic passes by on Farrington Highway. 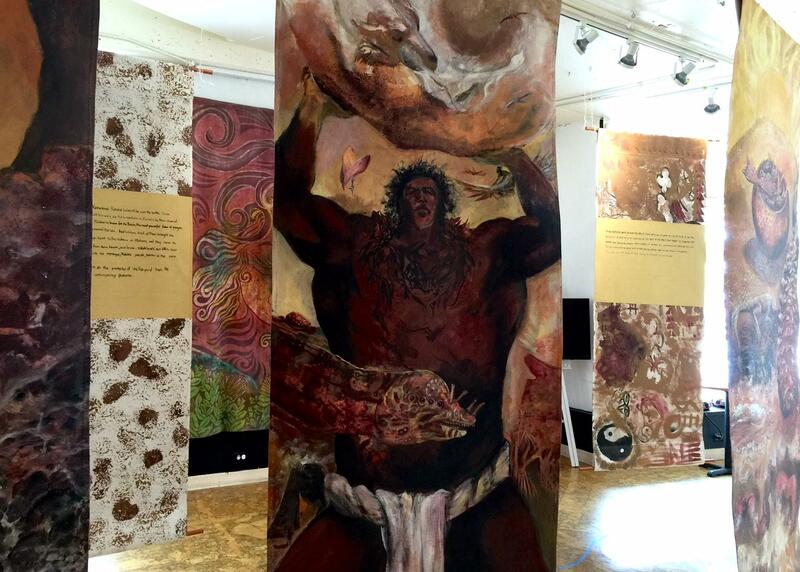 The Pu‘uhonua Society’s annual CONTACT exhibition opens tonight at the Honolulu Museum School. This year, artists across the state were encouraged to dig for personal reflections on the theme of “Foreign and Familiar.” HPR’s Noe Tanigawa stopped by after the selection process to get the jurors’ thoughts on the show.